Believe it or not, another small G protein with GTPase activity, Rheb (Ras homolog enriched in brain), is involved in both mTORC1 recruitment to the lysosomal membrane and activation of mTOR. This interaction is also shown in the figure above. Mostly, Rheb is involved in activation of the kinase activity of the mTORC1 complex and specifically the phosphoryation by mTOR of the substrates S6K1 and EIF4EBP1. In the presence of growth factors, Rheb is localized to the membrane by a lipid anchor (a farnesyl group). The mTORC1 kinase-activating activity of Rheb stands in contrast to the role of the Rag G proteins which appears to be chiefly recruitment. How is the small G protein Rheb regulated? Of course by its interaction with yet another GAP, named the tuberous sclerosis complex (TSC). In the absence of growth factors, TSC binds to Rheb and, acting as a GAP, promotes GTP hydrolysis. This inactivates Rheb, inhibiting mTOR kinase activity. How then is Rheb regulated? One way is through phosphorylation by AMP Kinase, an enzyme that is itself regulated by the energy level of the cells (see Chapter 9C-10: AMP Kinase). AMPK phosphorylates and activates the TSC, which, acting as a GAP, inactivates the small G protein Rheb complex (TSC complex). Sestrins 1 and 2 may also regulate AMPK. The figure also shows that AMPK phosphorylates and inhibits mTORC1. AMPK activates processes when energy is needed (glycolysis, lipolysis) and inhibits those when energy is abundant or when cell growth and proliferation occurs (fatty acid and protein synthesis). 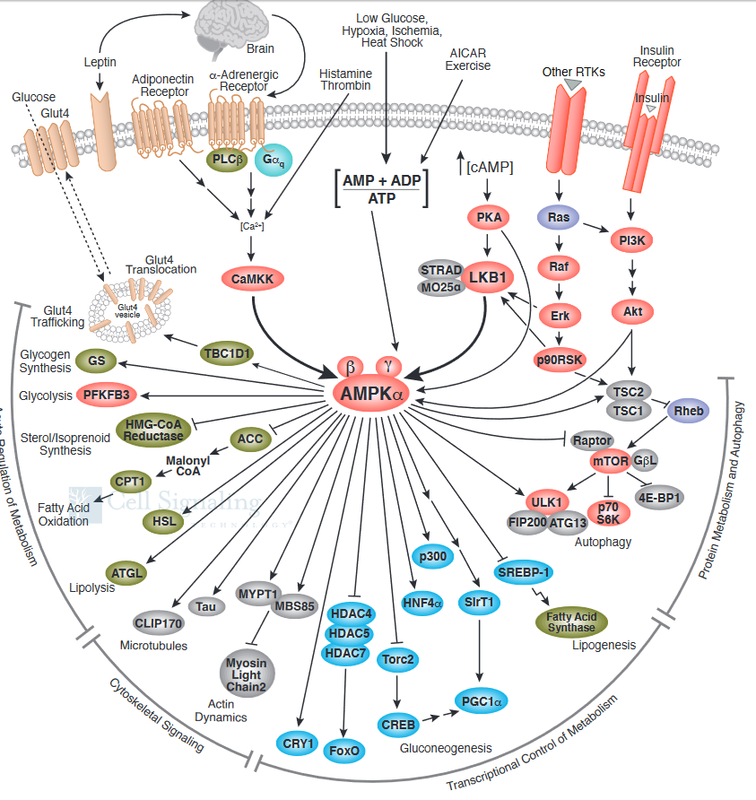 Hence AMPK activates catabolism while mTORC1 activates anabolism. Both can be viewed as master regulators of metabolism.